LOVELY KAREN MILLEN BLACK AND MULTI BLOUSE TOP. V NECK FRONT WITH WATERFALL TRIM. BLACK WHITE GREY AND RED TONES. PULLS ON OVER HEAD WITH NO FASTENINGS. Material: Main: 96% Polyester, 4% Elastane. Contrast: 100% Silk. Lining: 95% Polyester, 5% Elastane. Colour: Light Grey. Note:- The product is of 1st Grade Quality,NOT Factory 2nd Grade Quality or used. 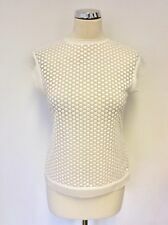 This stunning top is tailored from a lightweight mesh and exquisitely embellished with sequins and beading as you would expect from Karen Millen. It has a ribbon tie at the waist and is perfect for wearing over and dressing up any black dress or even for adding that little bit of sparkle to a pain black top and trousers. Brand new with tags still attached. I will point out that the delicate mesh fabric has a couple of little imperfections at the back. I have enclosed photos so that these can be seen but I am being way too honest for my own good as when worn these are not visable in the slightest.